The Men’s Inn provides emergency shelter services to over 350 men each night. Guests typically receive a bed after meeting with a case manager, who will help them chart the next steps toward securing permanent or transitional housing, job training, substance abuse counseling or other needed services. Since its founding in 1969, Pine Street Inn has been a place of refuge to Boston’s homeless residents. Today, emergency shelter remains one of Pine Street’s core services, along with permanent, supportive housing, job training and street outreach. Nearly seven hundred men and women come to Pine Street for shelter each night. Many come to Pine Street after losing their home and running out of family or friends to stay with. Others seek shelter after struggling on the street for weeks, months or even years. Whatever their story, they are welcomed as guests by Pine Street staff. 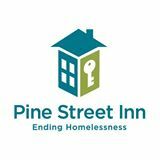 Pine Street's shelters provides guests with food, clothing, health care and case management services. Pine Street provides more than 230,000 overnight beds over the course of a year. In addition to a bed, the Men’s Inn offers guests two meals a day, shower and laundry facilities and a health clinic. From the Men’s Inn, many guests move on to one of Pine Street’s transitional programs. The Women’s Inn is New England’s largest emergency shelter for women, providing a safe place to sleep for 120 women each night, as well as recovery programs, health care and housing. Counselors create an atmosphere of welcome and respect while providing critical services that help guests reclaim their lives. Opened in 1983 by Governor Michael Dukakis, the Shattuck Shelter offers year-round overnight emergency shelter and support for 120 homeless men and women each night. Guests receive two hot meals, showers, clothing, a clean bed, and support from counselors and nursing staff. Shattuck Shelter also provides assistance for guests who are struggling with addiction, legal, financial, mental health and physical issues. Posting Comments below is for viewers on this website only. If you have information that can help users regarding Pine Street Inn - The Men's Inn, please provide it below.